An unlikely duo at MSPCA-Angell's animal shelter in Boston is hoping to be adopted together after they were surrendered in the same crate. The pet pair's bond is so paws-itively unique and true, that the two were even surrendered to the shelter in the same pet carrier. 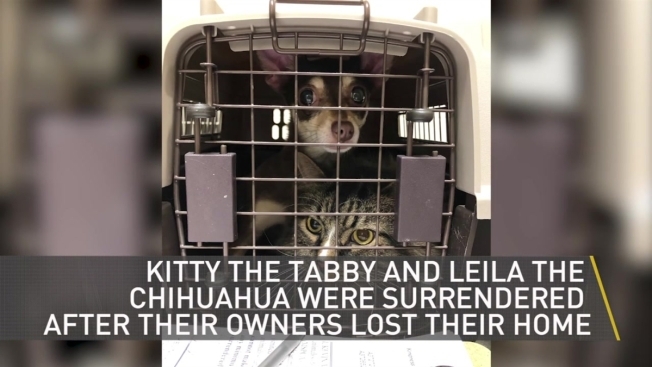 Staff initially tried to follow protocol by housing the pets with their respective species, but Kitty would yell when she would be separated from Leila. Now, staff at MSPCA-Angell's are determined to keep them together and have even broken protocol for that very reason. "Leila is 2 years old and has lived every moment of her life with Kitty," said Anna Rafferty-Fore, associate director of the MSPCA’s Boston adoption center. "They are each other’s best friend and keeping them together has made a very difficult situation much easier for them to handle." The animal shelter is seeking adopters who are willing to welcome both Kitty, age 6, and Leila into their homes. The dynamic duo are described by staff as "playful, affectionate and gentle." Those who are interested in adopting these best friends can email adoption@mspca.org or visit the MSPCA's Boston adoption location in Jamaica Plain.